When I was in high school I used to play keyboards in a band. While my own sweet PSR series Yamaha gave me much pleasure, I used to often salivate over some of the high-end models which I could not afford. Among these, keyboards made by the Kurzweil company used to seem especially sophisticated and insanely expensive and the most I could do was occasionally try these out when I attended concerts arranged by friends who were professional musicians. I had absolutely no idea then that the founder of the keyboard company was really known for things that your average keyboard designer could not possibly dream of. Ray Kurzweil- child prodigy, engineering genius and inventor of several socially significant technologies like the flatbed scanner and a machine that reads out to the blind, multimillionaire, winner of the National Medal of Technology, founder of myriad start-ups- is best known today as one of the world's most high-profile soothsayers. In the pantheon of thinkers who think of technology as a panacea to all our troubles, Kurzweil is certainly at the forefront. In his 2005 book "The Singularity is Near" he laid out an astonishing version of the future in which mankind's intelligence will seamlessly fuse with machine intelligence in an unprecedented, warp-speed event called the "singularity". This would happen no later than 2029. Hearing this, it would be easy to dismiss Kurzweil out-of-hand without further thought as yet another loony new-age guru until you find out that many quite accomplished and clear-thinking individuals including Bill Gates, inventor Dean Kamen and the founders of Google take him quite seriously. So who exactly is this Raymond Kurzweil? 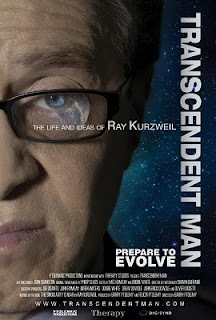 Filmmaker Barry Ptolemy decided to find out and the result is "Transcendent Man", a film about Kurzweil which I watched yesterday with a mixture of fascination and disappointment. The film is playing in selected cities but the DVD and a digital download are already available on the movie's site. Ptolemy probes into Kurzweil's life and finds a brilliant, articulate, curious, sad, haunted man who sheds tears over his father's grave, collects cat figurines and undergoes monthly blood tests. Philip Glass's haunting, edgy score adds to the allure of this unique individual. A child prodigy who built a music-composing computer when he was 17, Kurzweil holds dozens of award-winning patents worth millions. But beneath the success flows a silent undercurrent of emotional upheaval. Kurzweil is a man who had such a close relationship with his father and such a profoundly negative view of death that he has resolved to bring him back from the dead by recreating him from memories and memorabilia about him. He is someone who pops about 200 pills a day in the hope of staying alive at least until the day when his intelligence and personality can be downloaded into a computer so that he could discard this wretched, mortal body that we are all cursed with. And he sincerely believes that the day will arise when our only identity will be online and that using nanotechnology and AI, we will expand our intelligence to span the entire universe in a kind of grand cosmic denouement that will make the universe come alive and allow the human species to achieve immortality. Yes, it is easy to dismiss Kurzweil as someone who has discovered an unusually liberating new controlled substance. And yet Kurzweil is not your garden variety wild-eyed rapture-seeking bearded madman. In fact, not having seen much of Kurzweil before, I was struck by how reasonable and self-assured he appears. Absent are the strenuous gesticulations, defensive maneuvers and jargon-flinging that are the mainstay of snake-oil salesmen like Deepak Chopra. Kurzweil seems genuinely familiar with much of today's cutting-edge research in artificial intelligence, nanotechnology, genomics and medical science and lays out his thoughts rather carefully. The problem is that the probability space of his thoughts and prognostications is highly expansive and inhomogeneous. There are predictions that seem to be within the realm of possibility in a very general sense. There are those which are at least based on currently existing technology. And then there are those that are not just out there but demonstrate a decided failure on Kurzweil's part to think things through. Unfortunately that last category dominates Kurzweil's thinking to such a significant (and often fatally flawed) extent that while fascinated, I ended up ultimately underwhelmed with both the man and the film. First of all, let me lay down the areas where I do agree with Kurzweil. Unlike some others I don't think he is a "sophisticated crackpot"; it seems to be more a case of blinkered vision that's based on several generally accepted principles. Technological innovation can indeed be exponential and unpredictable. As he puts it, it took a very short while (and a very startled Gary Kasparov) before a computer was able to defeat a human expert at chess. The twentieth century was the epitome of amazingly rapid technological advancement and most of today's innovations would seem like miracles for someone from 1900. The twenty-first century is very likely to witness future such miracles. Most importantly, I agree with Kurzweil that perhaps the defining technological event of this century would be the integration of the human body with electronics. This would likely start with simple but breakthrough implements that enable physically and mentally disabled people to access the world around them but would then probably lead to astonishing inventions that allow us to remotely manipulate objects through embedded electronic components. My agreement with Kurzweil also extends to breakthrough medical diagnostics enabled by nanotechnology that allow us to diagnose and treat diseases like cancer at a very easy stage. Nanoparticles are already being used for drug delivery and there is every reason to believe that disorders would be treated in the near future by injecting cell-sized nano-'robots' that are about as intelligent in sensing and manipulating their chemical environment as you can imagine. Yes, I am on board with Kurzweil in evincing a sense of wonder at all these possibilities and I suspect that's the main reason why so many reasonable people seem to hear him out. So where's the glitch? As Neil Gershenfled who knows Kurzweil and directs the Center for Bits and Atoms at MIT puts it, "What Ray does consistently is to take a whole bunch of steps that everybody agrees on and take principles for extrapolating that everybody agrees on and show they lead to things that nobody agrees on," because "they just seem crazy." That is indeed the gist of what's wrong. To me Kurzweil's thinking seems to suffer from two main…drawbacks (to put it mildly), even ignoring the fantastic nature of his predictions. First of all, he seems to regard historical precedent as virtually sacrosanct. As with many others, Kurzweil's starting point is Moore's Law which basically applies not just to microelectronics and transistors but also to technologies like genome sequencing and brain-mapping. I think pretty much everyone agrees that the time is not far at all when we could get our genomes sequenced for 100$ a piece. The rate of progress in mapping the activities of single neurons is also very impressive and likely to accelerate. Technology has indeed manifested itself exponentially. But that does not mean that there are no limits and that every successive stage is as facile as the previous one. Just because we have gotten through eight exponential cycles of technological expansion in thirty years does not automatically mean that the next eight cycles are going to be equally smooth. They may possibly be, but it may well be that the next four cycles are a breeze and then we get really stuck at the fifth stage. Or it may be virtually impossible to overcome the obstacles that we encounter in the third stage. A computer simulating chess is very different from a computer simulating a human brain. Given the complexities of the systems we are dealing with, it's virtually impossible to predict the exact course of events that progress might take, no matter how rosy a picture of limitless technological adaptation the past sets up before us. Especially when it comes to our view of future technology, Kurzweil should be the first one to tell us that the past is far from a perfect guide to the future. This brings me to the second and most important problem with Kurzweil's predictions, which is that for all his acumen, the man seems to be almost completely unconcerned with details. You know, the things that can actually matter in developing any kind of science and engineering. This also leads to him virtually ignoring all the ways in which thing can go wrong. Consider this: one of the central events in Kurzweil's journey to the singularity will occur when we are able to reverse-engineer the human brain. Chew on that a bit. Reverse-engineering the brain entails mapping every connection, every axon, synapse and dendrite inside our remarkable 3-pound 'thin-bone vault'. And why exactly is Kurzweil so optimistic about this astonishing development? Why, because not only are we making unprecedented progress in mapping neuron activity, but the essence of neural reverse-engineering will be based almost entirely on capturing the genome sequence that codes for the brain. There is so much wrong with this viewpoint that I will leave it to others (Derek Lowe, PZ Myers, Luysii) to demolish the argument and emphasize the complexity of the brain. I have no doubt that finding out the genomic basis of neuronal connectivity will be a landmark discovery, but for all his engineering genius, Kurzweil seems to be woefully ignorant of the sheer complexity of biology. With this viewpoint he also affirms his membership in the group of starry-eyed optimists who are completely enamored with the "omics" revolutions. These optimists seem to equate data with meaning. The genome is the raw material, the starting point for any kind of biological organization. If the genomics revolution has taught us anything, it's how impoverished our knowledge of biology remains even after sequencing the genome. Most importantly, we have light years to go before we can understand the complex signaling networks that functional proteins form with each other and with genes, the subtle and fine-grained interdependencies of the components and networks with each other and the non-linear and startlingly indirect effects that perturbing these networks can have on physiological processes. As just one example, the recently delineated phenomenon of functional selectivity demonstrates how subtle effects on multiple pathways mediated by a single G-Protein Coupled Receptor protein can modulate complex biological processes. Add to these layers of complication the control that epigenetic modifications exercise and you have a Dante's version of the hell of biological complexity that goes far beyond anything the genome sequence can tell us. And this is where Kurzweil ultimately disappoints. Anyone (and certainly an engineer) who is studying or engineering complex systems knows how much the details matter. Every bench scientist or code-writer knows how the most unexpected and annoying details can thwart the design of simple experiments. And let's not even get started on the details of the technical, existential and ethical problems that true AI would engender. It would be one thing if Kurzweil discussed these problems and gave reasons for why he doesn't think they matter. But it's quite another when he steers virtually clear from and does not even allude to details and pitfalls. In the absence of recipes for identifying details and solving problems, prognostications are castles in the air, ephemeral beasts whose existence is at the mercy of hard reality. Among Kurzweil’s predictions are the end of aging, the distinct transfer of human intelligence into machines and the unbounded expansion of human intelligence into the entire universe. Many have relegated such dreams to the long-standing bin of human hubris. I myself am not too bothered about the part about hubris; if humans really wanted to give up their conceit and stop asserting their dominance over nature, they have long-since lost the chance. I also don’t have a problem with technological optimism and I take a rather dim view of the criticism of technology as a cure to all our woes; that’s precisely how we as a species have been developing and using technology since the discovery of fire, and as far as we do it responsibly and realistically, it’s a little hypocritical to scream foul murder now when someone proposes grand technological solutions to humanity’s most pressing problems. No, what disturbs me most about Ray Kurzweil is that, quite apart from his blithe indifference to details and problems, it appears that in his quest to make mankind immortal, Kurzweil is somehow falling prey to the same fears that haunt him. He seems to evince a genuine distaste of death (he wouldn't be the first one) and much of his feeling seem to be motivated by the profound feeling of loss he faced after his father's death. He says that we lure ourselves into a false feeling of satisfaction by constructing all kinds of myths and comforting stories around death. Perhaps, by postulating mankind's and his own immortality by 2029, Kurzweil is doing the same thing? "...perhaps the defining technological event of this century would be the integration of the human body with electronics." That has been going on for decades. Pacemakers for example, but also consider newer devices such as the implantable hearing aid (I used to work there), cochlear implants, the various intelligent prosthetic devices that you see diabled vets wearing... the list goes on and on. Artificial eyes are coming soon, as are devices for controlling epilepsy and other conditions. But you might see a common thread with these newest devices - they all feed information into the brain. Getting stuff out of the brain will be the breakthrough. Once that happens, then things will really take off. Yes, I was mainly thinking of devices that can actually extract information from our brains and communicate it to other devices. The film featured a scientist who had a chip implanted in his arm by way of which he could communicate remotely with a robot hand. I think that opens up some interesting possibilities. Miguel Nicolelis is currently doing some very interesting research in this area. What's certainly become clear, and what actually has been clear for a long time, is that how we think and how anything that can broadly be described as a universal Turing machine works (ie anything we use for algorithmic computation) are quite different. There's no evidence to suggest that apart from some superficial analogues (the transmission of electrical impulses and the manifold connections) that there is any similarity between artificial computational devices and natural brains. In fact, it's led down a blind alley (consider the entire 1980s Japanese program to develop a 5th generation machine, for example - which cost $400mn and failed to deliver convincingly on any of its goals). I become more convinced, year by year, that the substrate of consciousness actually *does* matter, that blood, fat and water are actually necessary parts of the process, and that separating mind from brain is about as feasible as separating heart from heartbeat. This is really one of the best essays on Kurzweil I've read.